As of November 3 2016, Scopus will no longer support Internet Explorer 9 (IE9). In January 2016, Microsoft announced its official discontinuation of Internet Explorer 8, 9, and 10 (more information can be found on Microsoft’s support page). Scopus is in the process of improving its workflow by updating its user interface to the latest technology, HTML5. Scopus aims to provide the best possible user experience, utilizing the most effective tools and most powerful technology. Moving from older technologies to support new ones enables us to improve the performance of the product and develop a better user experience for all our users. Older browsers like IE9 do not support HTML5, the new industry standard for structuring and presenting content for the web. HTML5 supports mobile devices, doesn’t rely on plug-ins, and provides a faster customer experience. Per 1 October 2015, Scopus will no longer support Internet Explorer 8. This is a few months ahead of Microsoft’s official discontinuation date of January 2016. For more information please visit Microsoft’s support page. In order for our users to continue benefitting from Scopus’ new features and functionalities, we would like to recommend upgrading your browser to IE 9 or higher, use Google Chrome or Firefox browsers. 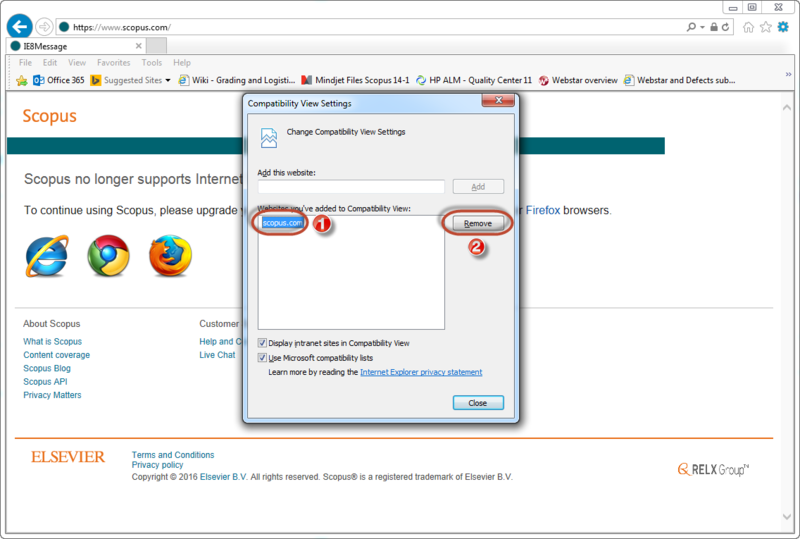 On Wednesday March 12, a fix was made in Scopus to support Internet Explorer 11. 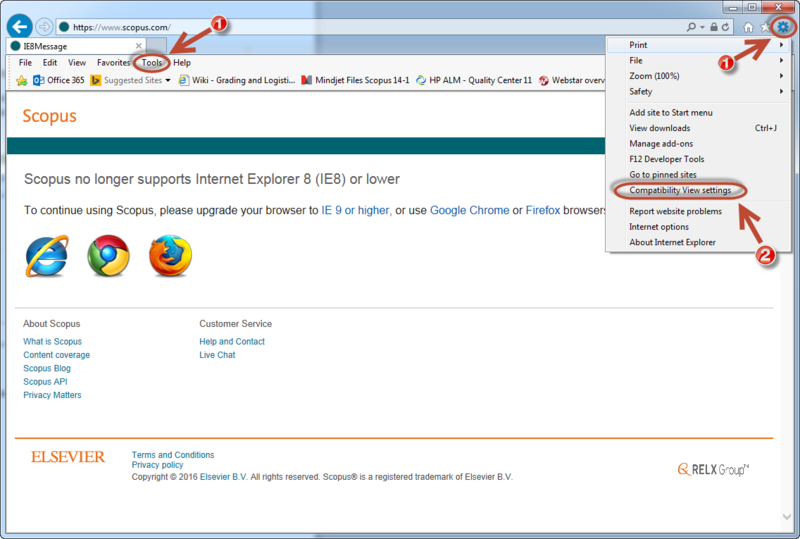 Users no longer need to switch on the compatibility view in Internet Explorer 11 in order to properly view Scopus.com. For optimal user experience on Scopus.com we encourage users to use Chrome or Firefox. 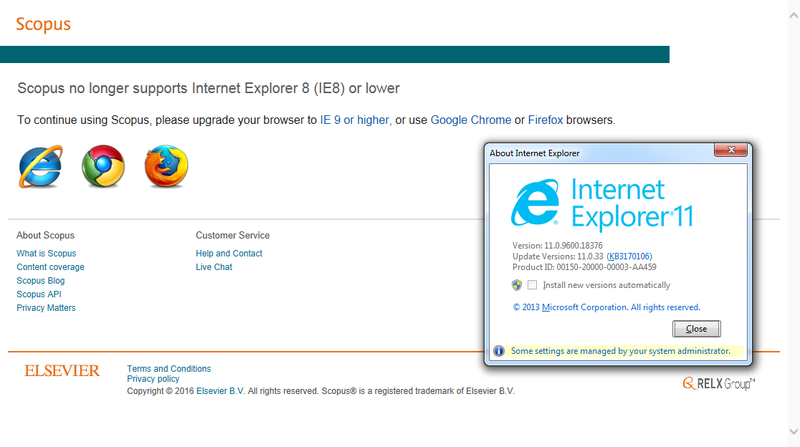 Scopus is currently compatible with IE7, however support is limited as the browser is nearing its End of Life (EOL) date. IE11 is not yet supported by Scopus. Users that are experiencing problems with IE11 while visiting Scopus.com can switch on IE11 compatibility view to ensure proper display. 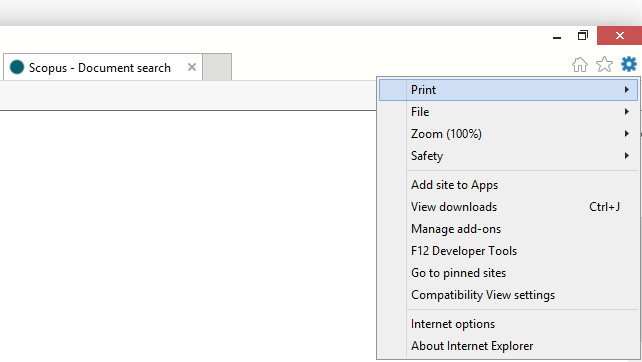 1) Open IE11 and click on the tool icon on the upper right corner. Click on Compatibility View settings. 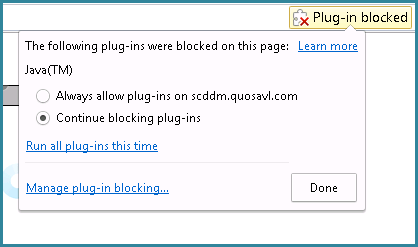 2) You will see the below popup.